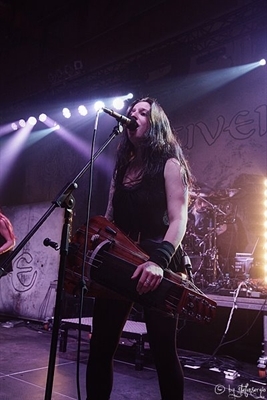 Sonic Cathedral’s Robin Stryker sat down with Anna Murphy, the female vox and hurdy-gurdy player for Eluveitie, for a behind-the-scenes look at Helvetios, the inspirational properties of gin, growing up in a touring metal band, and much more. Dive in! Robin: Hello Anna, and thank you so much for talking with Sonic Cathedral today! 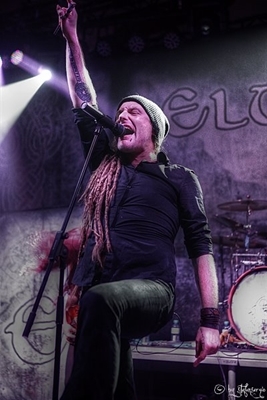 Eluveitie are about halfway through the North American tour with Children of Bodom. How’s the tour going so far? Anna: It’s actually going really well! We’re enjoying ourselves, and the Children of Bodom crowd seems to like us too, which we’re really happy about. A lot of our fans are coming to the shows, and it’s been going really, really great! Robin: You guys went from 70000 Tons of Metal cruise right into the North American tour. What has been your most memorable experience? Anna: Hmmmm, that’s a very good question. I am enjoying pretty much everything because I LOVE American tours, so every day for me is actually really great. I don’t even know what the best show would be, because we got such cool crowds. So, for me, it’s just the whole tour that is really good. 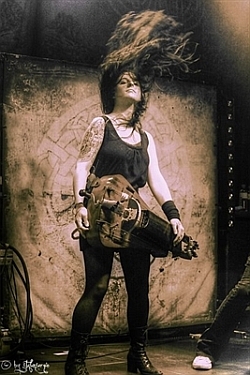 Robin: In addition to providing the female vocals for Eluveitie’s new album, Helvetios, you play the hurdy-gurdy. Of all the instruments, what made you (as a teenager) go: “yeah, I’m gonna learn the hurdy-gurdy”? Anna: Well, I saw it with another band once live, and I just immediately fell in love with the instrument, and then I wanted to get one. Robin: Had you played other instruments before taking up the hurdy-gurdy? Anna: I played piano for seven years, I played the bass at times and did some programming, and I played the flute … the transverse flute … but not really anything virtuoso. Robin: With parents who are both opera singers, you obviously come from a musical family. At what age did you first begin experimenting with music? Anna: Well, at a really early age. I basically HAD to take piano lessons ... I didn’t really want to, actually. I got into writing music around 16 or 17. Robin: That was about the time you joined Eluveitie, right? Anna: (laughs) I think I’m STILL not grown up, and I probably will never be. Yeah, it was pretty cool. I actually quit school to tour with the band, so it was kind of risky, and my parents didn’t know what to make of it. But they have been really supportive, and I’m really glad that I chose this rock-and-roll path. Robin: Would you tell us a little bit about the instrument that you use? For example, is there even a company that makes hurdy-gurdies, or did you need to find a specialist to create one? Anna: Yeah, you have to have them built by someone who builds hurdy-gurdies. There is no such thing as a company or anything. So, the two I have are custom-made. Robin: Considering how unusual your instrument is, what is your back-up plan for if something goes wrong when you’re on the road touring? Anna: Well, there is a simple answer to that: I’m basically fucked if that happens! (all laugh) I mean, I’ve got two instruments now, so that’s a good thing. We’ve had problems -- like the battery wires breaking and stuff like that -- but we’ve always had crafty men who kind of could fix these things. So far, I’ve never really had a major disaster. Robin: I will knock on wood that you never have a hurdy-gurdy disaster on tour. Eluveitie already has a huge and devoted following, but for Sonic Cathedral readers who may not yet know your music, what do you think makes Eluveitie special? Anna: To be honest, I don’t really know because we don’t always think about what we’re going to do, and we don’t plan what new elements we’re going to add to our music. But it’s probably the diversity ... I mean, there really isn’t another band that sounds like us. 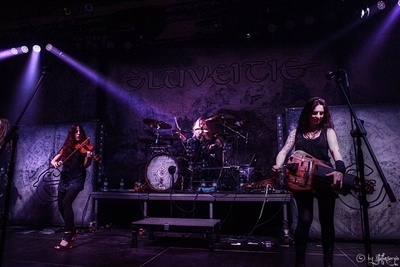 So I think, especially since we use so many authentic instruments, Eluveitie really has its individual sound that we’ve just been developing over the years. Robin: How does that work for live shows? The band’s founder, Chrigel Glanzmann, plays quite a number of instruments on the album. Do you have other people to play those instruments during live shows, or use backing tracks? Anna: We do have some backing tracks because, sometimes in songs, there are so many things going on that we can’t actually play them all at the same time. But apart from that, he just switches around with instruments. There are also some songs where I’m going to play flute because there is no hurdy-gurdy, so we manage quite well. Robin: I am a little embarrassed to admit that I was not so familiar with Eluveitie’s music until I saw the video for “A Rose For Epona.” Wow, powerful stuff! Would you tell us a bit about the story behind that song? Anna: It’s actually a REALLY sad song. It’s about a girl during the Gaulish Wars who loses faith in her goddess, who is Epona. Among other things, Epona was also a goddess who protected the riders … the riding soldiers. This girl’s husband dies during the Gaulish Wars, and basically all her dreams were crushed by this war. So now she is questioning whether this goddess actually exists. She is really frustrated because she went in for this belief, and now she doesn’t see the point in it because all her dreams have been crushed. Robin: Considering how heartfelt that song is, how did you get yourself ready to show that emotion in the video, when you were (of course) shooting take after take after take? Anna: Well, it was freezing cold, so it wasn’t really hard to not look happy in the video. (all laugh) It was actually pretty hard for me. At first, I just kind of stood there singing the song, and the people from the video company told me: “You have to move and dance and do stuff!” But that’s not me ... I’m a musician. That doesn’t mean that I can act and move well, and that’s what I told them. At some point, because I was so cold and so introverted, they got me a bottle of gin, which I decided to nip on. That got me in a better mood to actually shoot the video. Robin: What do you take the most joy in -- being in the studio recording, being behind the engineering desk, or being up on stage? Anna: I love both. When I’m at home engineering, I always think: “Oh, I don’t want to go on tour because this is so much more awesome!” And when I’m on tour playing really great shows, I don’t want to go home to do the other stuff again, because I think that’s more awesome. I think I just like both the same, but in a different way. Robin: Having eight members in the band (which is a fairly huge number) and performing with unusual instruments like the nyckelharpa, how do Eluveitie go about writing songs? Anna: A lot of people writing songs together definitely wouldn’t work. Our mastermind has always been Chrigel, and he mostly is the main songwriter. I’d say that the composing portion of the band is Chrigel, Ivo [guitars], Meri [fiddle] and I, where Chrigel and Evo act as the main songwriters. Whenever they are making melodies or accompanying lines or vocal parts, that’s when Meri and I step in and do our creative parts to it. Robin: Helvetios was the first time for you working behind the engineering desk at Soundfarm Studio, where the traditional instruments, bass and your vocals were recorded. 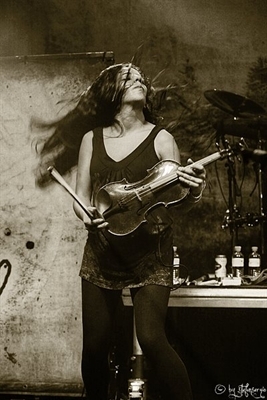 What was it like being on the other side of the desk when recording an Eluveitie album? Anna: It was a very GREAT experience, and it’s very interesting too because you kind of start seeing things from a producer’s point of view … and not just as a musician. Usually when you get a mix from a producer and you’re just a musician, you kind of automatically -- even if you’re a pretty objective person -- you still have this thing of “oh, I can’t hear my instrument” and “oh, I can’t hear my vocals. I wish they were louder.” And it wasn’t like that for me at all this time. Since I recorded that stuff and edited it, the whole thing was also like my baby. (laughs) So it was really interesting, and I like being both actually. Robin: With having worked as a sound engineer for a year or so, does that change how you approach going into the studio when it’s your turn to record as an artist? Anna: Yes, absolutely! It makes me want to be better … to achieve perfection. I mean, I know what can be done in the studio and how you can fix things. But that just makes me more want to record something without it having to be fixed. A few years ago, it probably would have been like: “Okay, that wasn’t that good, but let’s see what we can do.” Now I know how to do all these fixing things, but I still don’t want to. With me, it’s also kind of like a pride thing. Robin: You described engineering and recording Helvetios as giving you the most epic music challenges of your career so far. What was it about the album that was so epically challenging? Anna: The bar for the technical standards musically was just set so much higher than on the previous albums. Some of the stuff, I thought: “Okay, I’m NOT going to be able to play this!” It was like that for all of us. We just learned that, really, practice does make perfect. We just practiced this stuff repeatedly, and got better and better. I think we really evolved as musicians, on the technical side, just from recording the album. Robin: On the new album, which of the tracks do you really get to rock out on with your hurdy-gurdy? Anna: Well, the most difficult to play is actually “Home.” That tune was just INSANE to play, so I’m going to have to practice that one a lot to play it live. But I think that once I master it, I’m going to have a lot of fun doing that. Robin: At live shows, fans always want to hear a mixture of old and new songs. 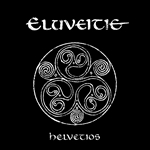 What songs from Helvetios are Eluveitie playing on this tour? 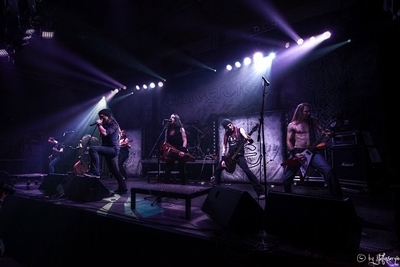 Robin: I have heard rumors that, at some point soon, Eluveitie will start working on the acoustic album, Evocation II. Is something already in the works for another acoustic album? Anna: It’s actually not in the process at all, and we haven’t even decided when we are going to do that. It might be the next album, or it might not. That’s still written in the stars, because now we are busy promoting Helvetios. When we find a calm week, then we can start working on new material. Robin: I’m not sure how you guys will find a calm week, when Eluveitie are going straight from the North American tour to a headlining slot on the Paganfest Tour. (laughs) What are you going to do to unwind between tours? Anna: Well, we’re going to rehearse the set of Paganfest, because we’re going to be playing even more new songs. I guess we won’t have time to do that much more. Robin: Will you get a chance to sneak in a short vacation? Anna: (laughs) I don’t think so. But the tour was kind of a vacation too, so that’s okay! Robin: (laughs) With all the cities you’ve played on this North American tour, do you even know where you are right now? Robin: Is there anything else that you would like to tell Eluveitie fans directly? Anna: I always just want to say “THANK YOU” to our fans because, if it weren’t for them, I wouldn’t be sitting here in El Paso. Their support is the most important thing to us, so thank you!!! Robin: Anna, it’s been a pleasure talking with you! Anna: Thank you very much!